Come on, lets me honest, ocean rowing wasn't terribly well thought through. I mean, you're rowing BACKWARDS into a vast ocean and can't see where you are going. How do you know you are not going to crash into something? Thankfully modern technology has got our back.... literally. It is an automated tracking system used in the marine world, where its primary purpose is to prevent boats colliding with one another on the water. An alarm will sound on the boat when you are on a collision course with another boat or a certain distance away from another boat. Think of the ultimate in reverse parking car sensor and you're almost there. It is compulsory for all vessels with 300+ gross tonnage and all passenger ships regardless of size to have an AIS. 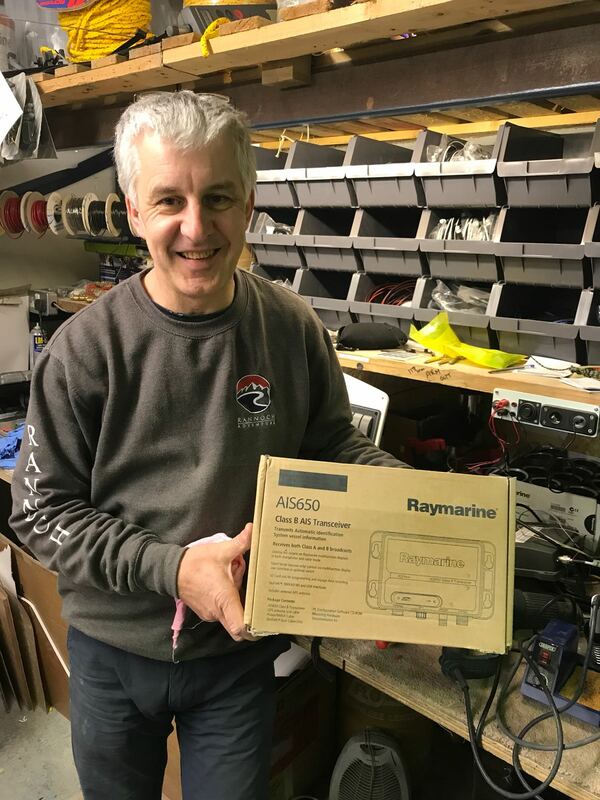 Given the nature of ocean rowing, the small size of ocean rowing boats and the vulnerability of a crew powered by human movement, all Rannoch boats are fitted with a Raymarine AIS Transceiver system as standard. What information does an AIS provide? An AIS allows vessels to view marine traffic in their area and to also be seen by surrounding vessels. The system provides the unique identification of the vessel including the call sign, MMSI, vessel name (all of which are unique to the vessel), vessel type, it's position, course and current speed. This picture isn't one from our system but it gives a good example of highlighting a potential collision. 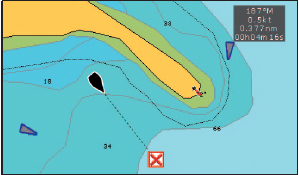 If you were the black boat travelling to the red waypoint, there are two possible collisions. The AIS alarm would sound on the boat enabling you to look at nearby traffic. You would see the how far the other boats are, their size, their speed and course. This would allow you to access the situation prevent a collision. How does the AIS work? The AIS is wired into the same system as the chartplotter. This means they talk to one another, so the Raymarine chartplotter is the visual display from the AIS, similar to the picture above. It shows all the other vessels that have an AIS and in range. Any boats that are in range but aren't on a collision course will show as a blue triangle. Any boats that are on a collision course will be shown as a red triangle. You will be able to click the triangles which will display the vessel's information; name, call sign, MMSI, SOG (speed over ground), COG (course over ground), vessel type (sailing vessel, cargo ship etc) and boat length.This information means you can use the VHF radio to communicate with the boat and prevent a collision. Do I need an AIS when rowing an ocean? "The AIS is probably the most important bit of electrical equipment on an ocean rowing boat. No one needs to be mowed over by a 100-metre container ship when they are mid ocean! Despite keeping our rowers safe, it can also be the most annoying bit of equipment. When training in areas like Burnham-on-Crouch or on the South Coast of the UK like many of our teams do, it can be a pain when the AIS alarm goes off every 2 minutes when you can obviously see there are boats within your surrounding area. What I do for training is to reduce the parameters to the minimal amount and then have a watch system where one of the crew is checking for local vessels. Normally when you are in busy areas, the team will be hand steering rather than using the autopilot so this team member will have their eyes on the water anyway. As soon you are in more clear waters and want to use the autopilot you can then increase the AIS parameters. When starting an ocean crossing, I will always have the parameters set to the maximum, so that as soon as another vessel is within VHF range, the crew on the boat are aware of it." Do you want to see something fun? If you fancy seeing all the boats with an AIS on board, visit Marine Traffic. Zoom in, move around, click some boats and see what information you can find. This is aeroplane spotting but for boats. Rannoch Adventure are the market leaders in ocean rowing boats. We also provide onshore and offshore training, equipment advice, weather routing, race tactics and boat logistics. If you have any further questions about an AIS, a technical question and want to know anything else about ocean rowing, send us an email to info@rannochadventure.com. Hit the subscribe button below and get new blgs deeivered straight to your inbox.